In the same week that a Belgian newspaper was criticized for publishing a racist caricature of President Obama and the first lady as apes, Belgian officials presented the leader of the free world with a life-sized gingerbread version of himself wearing slouchy pants and playing basketball. Belgian media reported that the gingerbread "biscuit" was the brainchild of Belgium's Radio 1, which enlisted the skills of Essense baker Ronny Demedts to craft the welcome gift for the president, who made his first visit to Brussels on Tuesday. 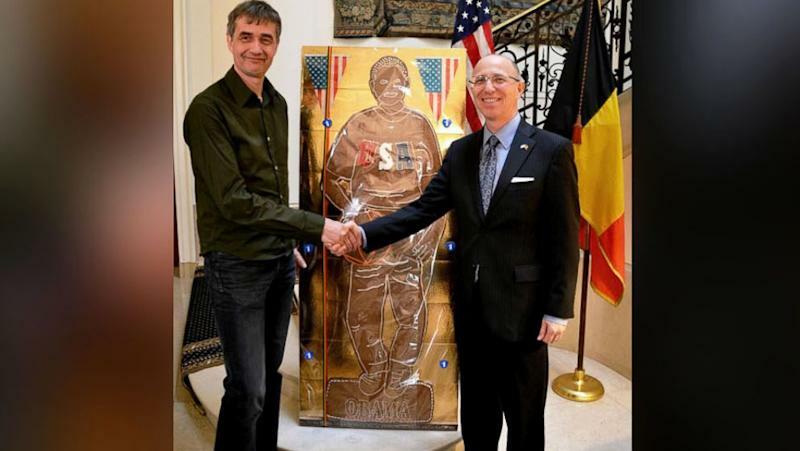 "There's been quite bit [sic] of Transatlantic dialogue on this cookie," Radio 1 cryptically tweeted, along with a photo of the cookie being handed over to Mark Storella, the Deputy Chief of Mission at the U.S. Embassy in Brussels (right). The gingerbread episode comes after Belgian paper De Morgen issued a full-page apology for publishing a picture over the weekend labeling Obama as a drug addict and doctoring another photo of the president and First Lady Michelle Obama to make them look like chimps. But it seems the president is unlikely to have his cookie and eat it too. As noted by Redditors, the Secret Service routinely destroys all food and drink gifts to protect the first family. "So this is our welcome gift for Obama," one Belgian national tweeted, according to a Bing translation. "I'm going to go be ashamed of me some in a corner."